What to Do with an Old School Pool? School Districts with older pools that have floated, no longer pass inspection, or pools that are simply underutilized, we have an answer to your dilemma. Other School Districts who have faced this problem just closed the door to their pool room, others use the pool shell to store old desks, chairs, athletic equipment, or general storage, etc., but this is obviously not the most efficient use of space. Plus there is still additional expense of insurance coverage and for the heating costs of the large area. So why do they keep the unused pool shell? Because the cost to update for current regulations is typically too much for schools that are already financially strapped. When you consider the expense of demolishing the concrete around the pool to gain access to cracked tubes, digging deeper and wider to comply with new regulations (in some circumstances), then rebuilding or resurfacing the pool walls/floor, it could reach $1M to get it functioning again. Plus, the shrinking of some Districts or the lower interest in swimming can make it less appealing to keep up with maintenance costs. So what’s a School District to do? In the last few years, we have remodeled pool areas for a handful of School Districts. At Northview Public Schools, we converted their existing pool into a fully functional community fitness center including a 3-lane walking/jogging track. Northview had several issues with their existing pool. The ceilings and lighting needed updating; the bleachers needed to be replaced; the diving well was not deep enough; there were not enough lanes; and it was costly to maintain. As a part of their 2011 Bond Planning, the District sought voter approval to build a new Natatorium that would include a new swimming pool and convert the existing pool space into a fitness center that the community would be able to utilize. The Community supported the proposal and the project began with infilling the existing pool; laying down athletic sports flooring; adding new fitness equipment; replacing existing windows with new, more efficient windows; and later completing the 3-lane suspended walking / jogging track. Then a new 13-lane competition pool was completed with enough pool depth to support diving and a shallow area that is used by the Community Swim Group. At Mt. Morris Consolidated Schools, the District decided that they no longer needed the pool, but could use room for an auxiliary gym instead. This would have required an addition to their school to make room if they hadn’t decided to modify their pool area as an alternative. We also infilled the pool and created a solid level surface with a rubber gym floor to morph the room into their needed gym space. Without the pool, the district is now able to hold practice at reasonable hours for all sports, they’ve eliminated the additional maintenance, HVAC, and insurance cost also. Similarly, at Montrose Public Schools, we converted their pool into a needed auxiliary gymnasium space with a wood gym floor. Other schools have been able to convert their old pools into dry storage space. If your School District has an underutilized pool or one in a state of disrepair, this may be the solution for you and as experienced Construction Managers of old school pool conversions, we are the team for you to contact! Please call 800-965-4278 (800-WOLGAST) to discuss your options. When you’re a small business owner who is responsible for your building, you likely don’t have a budget for a facility manager. Building maintenance probably isn’t something that hits your to-do list very often, but is still very important to the longevity and cost of building operation. Having a building maintenance strategy can help you proactively catch repairs, leaks, and heating deficiencies with way less expense out of pocket. I spoke with our VP of Contract Management, Steve Seibert, about what is the best way for non-facility managers to monitor their buildings realizing that they may have never needed to pay attention to such things. Steve said, “The most important thing to monitor is your building envelope, so that the integrity of the building stays intact.” He is referring to your roof, EIFS, siding, and windows. “Your EIFS needs to be inspected periodically, and every transition of dissimilar materials needs to be re-caulked as needed, especially around windows”. He said that the life span of caulk can last five years or more, but once a year, caulked areas should be examined for any cracks or missing material and be repaired. Another important part of your strategy is to manage your warranties. According to Steve, “If your single ply roof has a warranty for 15 years, call the manufacturer in year 14 to have them examine it.” Each manufacturer’s warranty will differ a little as it ages, but they should be able to make necessary repairs for little to no cost while it’s in the warranty period. If you wait until year 16, then any repairs or replacements will come completely out of your pocket. Things to look for on a shingled roof include fading, dinginess, and curling. The same philosophy of knowing your warranty period is true for your HVAC system. In addition to this, Honeywell now offers Light Commercial Building Systems to make smaller commercial buildings SMART at a manageable cost. It is an automated HVAC system operation that can save on heating costs and will notify the appropriate person when the system gets disrupted from its programming. This person will know immediately if there is an issue via an alert to their phone where ever they are. Other areas to monitor include lighting, electrical, plumbing, fire equipment, and access control. A quick internet search will lead you to thousands of Building Maintenance Checklists telling you specifically what to check on your building. However, our best advice is to keep your building envelope in good and clean condition, which will add to the life span of it and save yourself money and headache, too. For more than 20 years we’ve been helping schools to pass their bond elections, and going back further than that, our Education Facility Specialists are former School Superintendents who have worked on their own campaigns while leading their respective Districts. We have a lot of experience and want to help you know what works and what doesn’t when you’re creating your school bond campaign materials. The significance of your bond communication materials is to get accurate voting information to supporters. It’s important to include the date and times of the vote and locations of precincts. Most schools also include reminders of voter registration dates, tax change charts and descriptions of school improvements, however just reminding supporters to vote is the key to this part of the campaign without being polarizing to the “no” or “undecided” voters. Sometimes using graphics can be a double-edged sword. For instance, showing disappointed faces or the problems with the existing school may make supporters feel more compelled to vote, however, opponents or undecided voters may feel that it’s emotional propaganda and stir them to turn against the goals of the District. It’s better to stick to the facts and break down how minimally the tax increase will change, if that’s an option. Using neutral graphics of pie charts, graphs, blue prints, or your mascot may be better choices. What you can include depends on how the informational brochures are funded. Other schools fill in a tri-fold brochure with the list of projects that will be completed if the bond passes, and/or the verbiage of the ballot language. This is all good content as long as you also ask the recipient to vote and remind them of the date, time and location. You want to get all of your supporters to the voting booth on the right day because every single one may be necessary to get the bond passed. With Wolgast as your construction manager, our bond campaign experts will help guide you through the pre-bond phase and share our experience on how to pass a school bond. Please contact Rich Ramsey, Mike Pung or Joe Powers for more information, 800-WOLGAST. Experts claim that a form of Construction Management (CM) construction delivery was used in ancient times as far back as the pyramids. However, according to Construction Management Association of America, CM became known as a distinctive construction delivery option in the 1960s1. The need for a new construction delivery method at that time was due to more “sophisticated” systems being designed for large, complicated buildings and stricter regulations. It was a growth time for the HVAC industry with the introduction of air conditioning and computerized control systems2. More complex applications increased the role of the contractor to be more involved with the “specification of equipment and parts”. There eventually was a shortage of HVAC installers and with the increased desire for air conditioning, shoddy applications led to many problems. A problem which was well suited for CM advocacy between the Designer and the Contractor. Wolgast Corporation originated in 1948 as G. H. Wolgast Masonry by Gerald Wolgast, a Masonry Contractor, and then expanded to a General Contractor (GC) soon after. The company remained a GC for twenty years until Gerald and his sons were the first to add Design/Build services as an option to deliver complicated projects more efficiently. This method was great for buildings with a smaller square footage and shorter durations to build and worked well in many applications for another twenty-five years. At that time, ever the progressive contractor, Wolgast added CM Services to enter the education sector, officially. The new service groomed Wolgast to quickly become a top advocate for our school clients who had complicated systems, a long construction duration, and lots of construction activities to plan simultaneously. A team of Owners Representative, Architect and Construction Manager created the strong leadership necessary for large, complex projects guaranteeing that critical elements of design, cost, time, and quality would come together to deliver a project that the owner wanted and needed. Since 1996, Wolgast’s CM Division has completed more than $2 billion of in-place construction just for school clients. We now have three offices dedicated to CM Services and have worked with almost 150 of the 450 school districts within Michigan, plus a few in Ohio. Our staff is top-notch and our field managers are on our work sites 100% of the time. He or she is there to monitor the day-to-day activity and to help school officials arrange schedules, so that school activities can carry-on uninterrupted. This is only part of the reason why 80% of our clients are repeat customers. 1https://www.healthdesign.org/sites/default/files/an_owners_guide_to_construction_management.pdf, preface, page 1, reprinted with the permission of Construction Management Association of America, Inc. Preliminary plans, such as those provided in a Phase I of the Design/Build process, are the most efficient and economical means to determine the budget for your construction project. While there has been a shift in the numbers1, there are still many business owners out there who are skeptical of the Design/Build method of construction. They are more familiar with the traditional Design/Bid/Build method where they hire an architect, then have general contractors competitively bid the project, and the contractor with the best price/value builds the project. Early on, when we’re discussing the benefits of Design/Build with those who are skeptical, they have a difficult time accepting that they need to pay the nominal fee for the preliminary drawings (Phase I Design) so we can estimate the construction budget. Those who are accepting of it realize that they would be paying that and more at an independent architecture firm. In the Design/Build process, the Phase I fee is nominal to cover the team’s time to complete a needs analysis, make necessary regulatory investigations, create a preliminary design and seek bidding resources for a preliminary budget. Having a pretty accurate, yet ball park, estimate early in the process helps an owner obtain funding earlier. The information gained during the Phase I is accurate and sufficient to take to a bank to secure financing. Clients never get a separate bill for the Phase I cost unless the project doesn’t come to fruition, then the fees are billed to cover the team’s time at a fraction of the cost of a full set of plans. Furthermore, if obstacles arise while a customer is planning to build a building that cause them to change their mind, it’s less risky to commit to a portion of the cost of the design while working through the initial process. Additionally, having the flexibility to “tweak” the preliminary design so it fits within your budget is much more economical because you don’t have the engineering elements involved, yet. Those get explicitly defined in the Phase II drawings. When you add a Design/Builder to your team before you purchase property, they can assess the property and available utilities to provide the best use of space. Also, prior to purchase, a Design/Build team can help coach an owner on contingencies in the purchase agreement as a buffer or a “get out of jail free card” if there are undesirable obstacles to using the property the way intended. Those are the main benefits to committing to Phase I Drawings, but the Design/Build process has other benefits like completing construction faster, fewer change orders, open communication, and one entity having all the low bids. Read more about the benefits of this method at in our White Paper, "Why Some Business Owners Don't Do Design/Build, but Should". 1 According to “Design-Build Project Delivery Market Share and Market Size Report” by Reed Construction Data and RS Means Intelligence, Design/Build construction delivery method has taken an additional 9% of the construction market since 2005 and General Construction has lost 10% of the market share in that same time. What Makes a Design/Builder a Dental Construction Expert? I’d like to address a question that has been posed to me about what makes a contractor specialized in Dental Construction. We’ve claimed for a couple of decades now to be an expert at dental office construction, but what does that mean? There are many people out there that think a building is a building, but most Dentists will recognize that a design/builder that’s versed in dental operations will make a big difference in the final building design, quality of construction and completion date. When an architect is familiar with dental operations, they create floor plans that help a Dentist, staff members and patients flow seamlessly. The elements that they consider include efficient means for staff to complete tasks, organized patient flow, space and regulations for special equipment, time-saving communication, and aesthetics to make everyone comfortable. An architect that understands how to design a Dental Office that incorporates all the efficiencies listed above will create a layout that allows for less wasted time to move throughout the building, enabling the Dentist to spend more quality time with patients and less time moving around the office to communicate with staff or find tools. When dealing with specialty equipment to take x-rays, distribute med gases, or recover mercury, an architect has to consider spatial issues, electrical needs and regulation. Without an understanding of how this equipment fits into an operation or the regulations involved, a mistake on the plans could trip up the construction phase schedule. For the construction phase, you’ll need a project manager and supervisor that are familiar with the goals and operation of the Dentist. 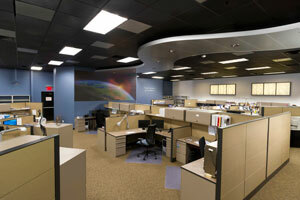 They’re there to oversee the proper installation of the various trades and maintain the schedule and budget. On the same notion as the architect, the Project Supervisor should have experience with x-ray shielding, mercury recovery, and med gases. A project supervisor with dental experience is also important to the schedule if a Dentist is renovating an occupied building and needs to continue seeing patients during construction. Your project supervisor can create temporary areas to keep chairs open. Regardless if it’s an occupied or new/unoccupied building, the supervisor and manager will be monitoring the schedule so that areas are ready in time for equipment delivery. Wolgast is specialized in the design and construction of Dental Offices. Dentists that we work with feel comfortable knowing that their chair side traps and amalgam separators will be installed without a problem and that their staff and patients will be comfortable in the new space as it’s completed on time and their scheduled move-in date is uninterrupted. Architects and engineers are smart people who are dedicated to taking the information their clients provide them and designing an aesthetically pleasing and functional building to meet their client’s goals. In their design specifications, they include specific products for building finishes, which they’ve researched or have experienced, to match the desired outcome expressed by their client. Typically, these materials or products have also been discussed with and accepted by the client. However, during the budgeting and estimating phase of the project, contractors and subcontractors alike may make suggestions for comparable materials/products. This may be because the subcontractor is more experienced with the installation of a certain manufacturer’s product, they know about a considerably less expensive application, or because the specced (specified) product is discontinued or back ordered for an undetermined amount of time. Keeping on schedule is critical for every construction job, so a back ordered item can cause many problems with the flow of a project. Also, what building owner doesn’t have an interest in saving money whenever they can? So, it’s common for a product substitution to be identified and as long as it’s comparable, the architect should sign off to accept it. The architect gets final approval on all substitutions because they have to be back tracked into the original plans and determined whether or not an item needs additional engineering to make the change work seamlessly. Typically, the building owner is excited to have options because of the cost and time savings, so substitution flexibility is important in the commercial construction industry. This practice can also be considered value engineering, which takes place in other occurrences when an original design comes in over the client’s anticipated budget. Due to time constraints of competitive bidding under the General Construction delivery method, substitutions and value engineering don’t naturally have time to occur. But, the team approach through a Design/Build project is set-up to make exceptions for these recommendations, which is another benefit of how Design/Build is more efficient in saving time and money. Physicians need to start thinking about retirement while still in medical school. During their education and training years, physicians miss out on nearly a decade of compounding interest on savings, one of the most powerful tools for building retirement savings. Furthermore, physicians may have less money and fewer years to contribute to their retirement savings. The IRS’ annual contribution limit for employees under age 50 contributing to 401(k)s and other traditional retirement plans is $19,000 in 2019. For those over 50, that contribution limit is $25,000 in 2019. However, these annual sums may be inadequate given the cost of and time devoted to medical education and training. The Association of American Medical Colleges (AAMC) estimates that 75 percent of medical students graduate from medical school with student loan debt. In 2017, the median level of medical school debt was $192,000. As a result, student loan repayments with normal terms can add up to more than $2,000 per month. And because the repayment terms for these loans can vary from 10-25 years, some physicians may still be paying off medical school debt at the age of 55. In the early years after college, when many of their peers are beginning to save for retirement and buy a home, physicians continue their medical education and training while simultaneously postponing earnings—sometimes by as much as 10 years. For physicians, then, traditional retirement savings vehicles may be insufficient to make up for lost time in saving for their golden years. Of course, another factor that threatens retirement savings for physicians is falling into high tax brackets. Because of their high incomes, physicians receive little to no financial aid for their children’s educations, and college savings for children inevitably impacts physicians’ own retirement savings. This may sound a bit bleak, but don’t be discouraged. If physicians build a diversified portfolio and pursue alternative investments, they may lessen the impact of a delay in retirement savings. One alternative investment for physicians to consider is purchasing or investing in their own medical office building. By establishing a separate Limited Liability Company (LLC) to buy the building, physicians and their partners can become landlords of their own medical practice. If there are additional tenants in the space, the LLC earns that revenue too. Additional advantages of owning one’s own medical office building include the ability to control costs, thereby effectively eliminating the possibility of falling victim to ever-increasing rent as well as the freedom to expand or change the space as desired. Of course, owning a building has the potential to be lucrative from a return on investment standpoint, but certain costs and conditions can negatively impact value. Before signing on the dotted line, physicians must complete a thorough due diligence and thoughtful consideration of all of the ongoing costs associated with property ownership, including utilities, ongoing maintenance, and upkeep. In addition, physicians should be careful to buy opportunistically and avoid overpaying as well as over-leveraging themselves prior to purchase. Partners in a medical office building are well advised to come to an agreement on certain processes ahead of a property purchase. Otherwise, they run the risk of disagreements that could threaten the success of the venture. What is the process for making decisions? What is the process for accepting a new investor? Who is allowed to invest in the medical office building? How many will be allowed to invest? How are ownership shares transferred (and what are the restrictions)? What are the policies for distributions and redemptions? Who is authorized to act on behalf of the partnership/LLC? What happens if a physician leaves the practice? Will he/she be obligated to sell his/her interest? How will the building be valued? How often should valuations be done? Ideally, investing in a medical office building will help physicians recover some of the savings they forfeited earlier in their career, but it’s not a guarantee. Pursuing alternative investment solutions such as this is one way for physicians to hedge their bets and potentially improve retirement savings outcomes. This article was authored by Michael Joyce of Agili, Your Personal CFO, a financial planning firm with offices in Richmond, VA and Bethlehem, PA. Speed is one of the most coveted aspects when it comes to commercial construction and nothing improves speed like doing a project right the first time. You could argue that cutting corners can sometimes make it faster, and that’s true until it causes rework, back tracking, or failures down the road. Our founder, Jerry Wolgast, had the philosophy of “do it right the first time” and that is still instilled in us today. However, we have implemented programs to help us consistently meet or exceed our deadlines rather than just hope that everything falls into place. Jerry’s sons would help their dad even as boys and they would tell you that he didn’t let them stop just because the sun had set, no, he would keep them going until their work was done. That work ethic is what helped us to secure our relationship with McDonald’s Corporation almost 40 years ago. And that relationship was and is very important to us as you can imagine. Through that work, we were able to systemize our processes and determine how to be more efficient and then apply it to future McDonald’s projects. We had even broken the regional record for fastest construction of a new store by completing it within 33 days. Soon, we were systemizing all of our processes so that each area of the company could uniformly be completed by any employee with the same job title. Our unmatched work ethic and consistency lead to efficiency, which resulted in fast, quality construction. Additionally, through our Design/Build Construction Delivery, we are able to shave months off the completion date by having the architect on our team. The open lines of communication with the architect and client launches our pre-construction planning and estimating earlier than it does in traditional General Construction Delivery because we have the information that we need to pull permits, order materials, and line up our team before the plans are complete. We will be ready to start construction as soon as the plans and budget are finalized. Finally, Wolgast became an employee-owned company in 2000, which means that every staff member became part owner of the company and benefits from the company’s success. Therefore, the importance of meeting deadlines and doing the job right is everyone’s concern from the laborer to the project manager and everyone in between. We’ve been known to put up a building in half the time a contractor down the street puts up a similar one. We’ve also landed a few projects because no other contractor can do it within the allotted time. This is all due to the importance we put on speed and we’ve managed to do it without sacrificing quality. Count on us when you want it done right the first time! Solid foundations…Solid results…the Wolgast Way! Most people envision a big box store when using the term “one-stop shopping”, and I’d bet that they would never think of a commercial contractor, instead. However, a design/build contractor provides one-stop shopping for architectural plans and construction services (and everything in between), also known as Single Source Responsibility (SSR). There are several key items to making any construction project successful and those include a collaborative team, detailed/accurate plans, competitive bids, and adequate time to provide a quality project. By using a design/build contractor as SSR, an owner gets an architect, contractor, and estimator as a package deal on their team by placing one phone call and that team takes on the full risk of providing an owner’s vision within budget and on time. The architect meets with the owner to determine the scope and creates preliminary (Phase I) drawings. The contractor collaborates with the architect to review the plans for construction applications and makes suggestions to streamline the building phase. The estimator then establishes a rough estimate providing a budget for the owner to take to his financing company early in the process. Alternatively, with the design/bid/build (or general construction) method of construction, the building owner takes on 100% of the risk, works with their selected architect to provide 100% complete drawings to the contractor who then bids it out without an opportunity for constructability review, and then the owner can only get an estimated budget just prior to construction. This method has been the standard since the beginning of the industry and has provided sufficient results, however, if there are going to be problems during construction, or over spending, it’s much more likely to happen with the design/bid/build method. Wolgast uses architectural firms with licensed architects who work with our construction team to get a constructability review prior to bidding. Constructability review is partially (along with open communication) what allows us to take on the risk of guaranteeing budget and delivery date, as well as starting construction early when needed. Speaking of starting early, since the SSR team is already familiar with the plans, they can get permits, order materials, prepare the site, and basically start the project before the plans are finalized, which can result in the project being completed months earlier than a design/bid/build project. SSR is A.K.A. a third name, Fast-Track Construction. SSR has an additional perk that not everyone realizes, and that is the multiple bid process. Many times owners feel that they are better off with the traditional means of construction, so they can get competitive bids, however the SSR method includes getting the multiple bids for subcontractor trade categories from qualified contractors. Furthermore, the SSR will have collected a wide variety of bids for each trade, so the holder of the bids will see who all the low bidders are for each category, rather than design/bid/build, which has several general contractors collecting a few bids from subs in the market. With SSR, owners are going to get great quality at a great price resulting in the best value!